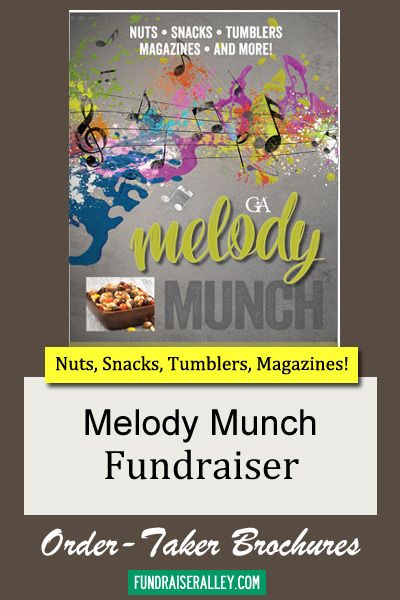 The Melody Munch Fundraising Brochure, brought to you by Great American, is my favorite order-taker fundraiser for Spring! It includes a wide variety of choices and price range, including nuts, snacks, tumblers, jewelry, and magazines. The Choir and Band tumblers, and music charm bracelet in this brochure make it a great idea for these clubs. Also, the CLASS of 2019 tumblers are also a great choice for high schools or any high school club. Add to that the yummy snack and nut choices and popular magazines and you’ve got a winning fundraising brochure! This brochure is great for any size group or for a whole school, especially high schools. It is a no risk fundraiser, using the free, colorful brochures. Give us a call, order your brochures, and get started! We recommend this for Band/Music Club or High School fundraising campaigns. 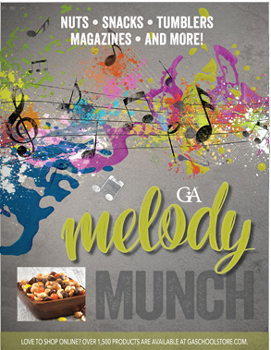 The Melody Munch brochure includes product photos and descriptions. The variety of product choices includes nuts, snacks, tumblers, magazines, and more. Something for everyone! Prices vary from $8 to $25.00.